Ames entrepreneur Steven Brockshus is the 2019 American Farm Bureau Entrepreneur of the Year, the Iowa Farm Bureau announced on Monday. It is the fourth time in five years that an Iowa-based company has won the Farm Bureau’s Ag Innovation Challenge. As one of the final four contestants, Brockshus presented a live pitch on Sunday at the American Farm Bureau Convention in New Orleans, and will receive a total of $30,000. Brockshus is the founder and CEO of Farmland Finder, an online service tracking and listing agricultural real estate in Iowa, Illinois, Indiana, Kansas, Michigan, Minnesota, Missouri, Nebraska, North Dakota, South Dakota, Ohio and Wisconsin. Brockshus is an alumnus of Iowa State University and graduate of the ISU Agricultural Entrepreneurship Initiative Student Incubator Program. 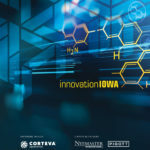 Iowa startup SwineTech Inc. founder Matthew Rooda received the 2018 award.